New to the hardware business? Congratulations! Welcome to the club. Hardware startup entrepreneurs face a lot of challenges. All for a reason. Navigating through the jungle of earning customers, product development, and setting up manufacturing processes, while trying to finance the whole darn thing, eventually leaves you with the feeling that you’re chasing your own tail. The further you go, the more your team and resourcefulness will be put to the test. Today, I’m sharing five tips that will guide you as you take your concept to market. Before you get too far with planning your crowdfunding campaign and go-to-market strategy, ensure that the product that you want to create is innovative and has a USP (unique selling point) that will attract your target market. The best way to do this is to define a specific problem and how your product will solve it. Explore how people are currently solving this problem and how your product will create a better experience. Then, you can start planning. You can use 2D or 3D printing to build models of your product at low cost, and quickly create a prototype so you can test it and improve any faults. At the end of this phase, you should have a prototype that is close to the final version. You should also have an initial product requirements document outlining the product features in detail that you can discuss with advisors and partners that can help you to produce your product. An accelerator can provide incredibly useful support to help you move along with your idea and prototype. Besides working with you on the product itself, mentors can advise you on all aspects of your business such as revenue models, funding, production, distribution and even marketing and PR. The most important thing is to find an accelerator that meets your business needs, so make sure you research your options thoroughly and select the right partner for both you and your business. For example, accelerators such as HighTechXL support tech hardware entrepreneurs throughout their journey. By working closely with an accelerator you will have the opportunity to connect with other businesses and entrepreneurs that will help you throughout your product’s journey and allow you to learn from both their mistakes and their successes. In many cases, if the accelerator you’re working with recognises potential in your product, they might recommend launching a crowdfunding campaign. Using a crowdfunding platform such as Indiegogo allows you not only to raise funds to develop your product or business but also to validate your product and support your R&D efforts, whilst giving you access to a database of potential new clients and supporters so you can start building a strong community. Crowdfunding can also be a great way to market your product and even get media attention. Whilst you are raising funds, it’s smart to start getting ready to manufacture. If you can deliver your products on time, your backers will sing your praises, and happy customers are more likely to return to you and spread the word, whilst unhappy customers can generate significant negative ‘buzz’ around your product. Some crowdfunding platforms, like Indiegogo, have partnerships with companies such asArrow Electronics and Riverwood Solutions, which support entrepreneurs with electronic device manufacturing. These partnerships can help you ensure your product is ready to be shipped to your customers. If your product is already ready to go, you can start conversations with retailers and distributors, taking advantage of the boost generated by your crowdfunding campaign. Your accelerator and other potential investors will be able to advise you in terms of retail strategy, but crowdfunding can also give you a push. 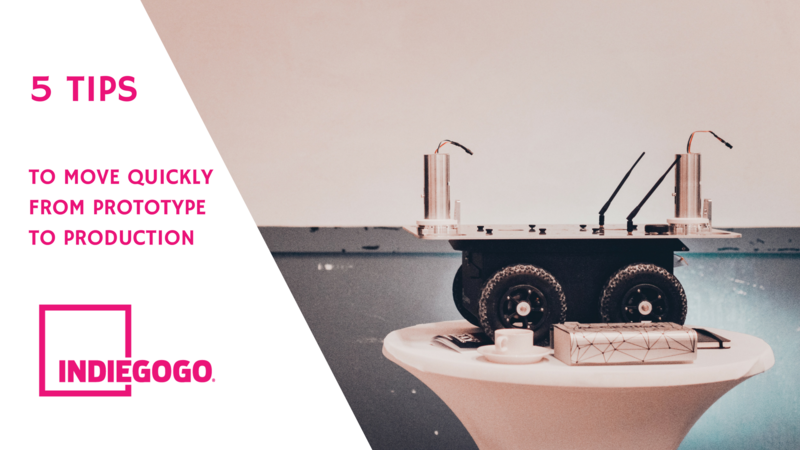 At Indiegogo we have been working with retailers like Amazon and Brookstone, to help campaigners to transition to commerce. In such a competitive market, it’s crucial to move quickly, so make the most of your mentors, advisors, and partners to bring your ideas to life before your competitors do.